Photo by SFBike, via Flickr. With Bike to Work Day coming net week, the city of San Francisco has been increasing its bike infrastructure around town. One of the recently-completed projects was to paint a bike lane on Market Street. Papandreou and his team noted that even if there wasn’t data that demonstrated these lanes were safer with green paint than without, the perception that this space is dedicated to cyclists was an important signal to send to cyclists. Patel agreed. If creating visibility for cyclists is the most important thing for securing safety and attracting new riders, said Patel, these lanes are a step in the right direction. It would sure be great to see something similar here. There’s a lot more pics on the Streetsblog S.F. post. 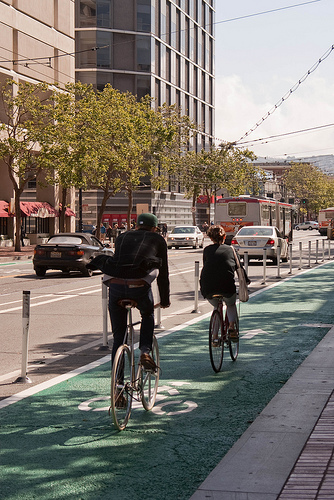 The blog also has a nice series of posts on other cycling improvements in San Francisco, including on-street bike parking. Also, check out this new bike map and route finder assembed by the San Francisco Bicycle Coalition, the Bay Area Air Quality Management District, SF Environment and the Metropolitan Transportation Commission. Also, a reminder that Metro’s second bicycle roundtable is this evening from 5:30 p.m. to 7 p.m. at Metro headquarters. Here’s the flier.